TULSA–Clean-up and feeding efforts by Baptist General Convention of Oklahoma (BGCO) disaster relief volunteers in the Oklahoma City and Tulsa metro area were expected to continue only through the weekend of March 28-29, according to BGCO disaster relief director Sam Porter, who toured the most severely impacted areas of Tulsa, Sapulpa and Sand Springs on Fri., March 27. Feeding unit leader Lou Martin of Sapulpa reported that the 31-member crew had prepared 550 meals for lunch March 27 and another 550 for the evening meal that day. American Red Cross Emergency Response Vehicles delivered the meals to affected areas. 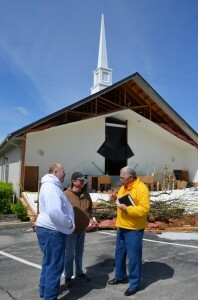 Porter, who said BGCO disaster relief volunteers are motivated by their Christian faith to serve people in need, also visited Keystone Hills Baptist Church in Sand Springs, which sustained major damage to its auditorium in the storm. 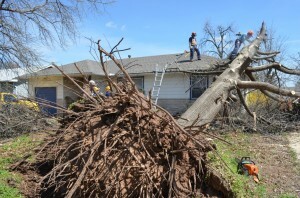 For more information about the Oklahoma Baptist disaster relief operation, or to make a tax-deductible donation, visit www.okdisasterhelp.org.